I had a somewhat delayed reaction to the death of acclaimed writer David Foster Wallace this fall. I had, of course, heard of him, but had not ready any of his work, although I had planned and still plan to read The Infinite Jest, called by many critics as one of the greatest books of our time. As I read some of the obituaries about him that began to unfurl, along with the rather gory details of the circumstances of his death (he hung himself), I began to be somewhat haunted by him, as we sometimes are by those that mysteriously take their own lives when, ironically, it appears that they have everything to live for. As it turned out, only those closest to him knew that he suffered from serious depression and mental illness, that had begun to encroach more and more upon his life, literary and otherwise. 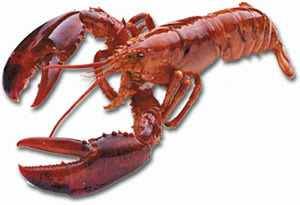 I also came across the essay "Consider the Lobster," which he wrote for Gourmet magazine in August 2004, and which echoes many of the concerns we all have pondered when and if we eat lobster. Do they feel the pain of dying? Wallace must have indeed been an extremely talented writer to have caused such a stir about crustaceans - in what was supposedly to have been a rather straightforward article. Certainly in this case it was a happy accident that a writing assignment turned into a moral spotlight on man versus nature. But then again, that is the sign of many geniuses, literary or otherwise. They surprise us, and they sometimes shock us, and they almost always leave a lasting impression on our culture and our minds. Life is what happens when we are busy doing other things. Great writing, I believe, happens when we illuminate a topic in a unique light, even when we might have had other plans in mind. I plan to start reading some of Wallace's works in 2009, and I'm certain that the irony will not be lost on me -- that someone who so articulately and brilliantly described the moral question of pain should have endured and indeed inflicted such pain upon himself.